There is a yellow boy 2 feet on the left side of a 500 feet long street. The boy faces the street. On the right side of the street is a clown. 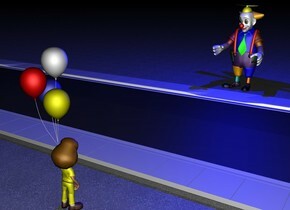 The clown faces the boy. The ground is pavement. above the clown is a big blue light. It is night.